Our playdate with Zenbo (and its master, company chairman Jonney Shih). It goes without saying that ASUS' first home robot, Zenbo, stole the show at this year's Computex. As soon as it rolled onto the stage during the keynote, everyone rushed to the front to get a good look at this cute little fella -- and that was before Chairman Jonney Shih shocked the audience with its surprisingly attractive low price of $599. Apart from its basic capabilities, little else was said about the machine, so we traveled all the way to ASUS' headquarters to meet Shih for a detailed demo. During the process, we managed to pry a little more info out of the exec, including what's inside this mysterious bot, the thinking behind its design and a target launch date around the holiday season. For a robot that's about a meter tall and can move its head, wheel around, recognize people and objects, and engage in voice interaction, $599 is almost too cheap. After all, that's in the same league as some of the unlocked flagship smartphones. From what I could see, the BB-8-like machine runs on four wheels (two large rubber-tired ones and two small assistive ones), and is able to avoid bumping into objects or falling down the stairs by using an array of sensors around its body. There are also speakers, microphones and a "full-day" battery tucked somewhere inside. 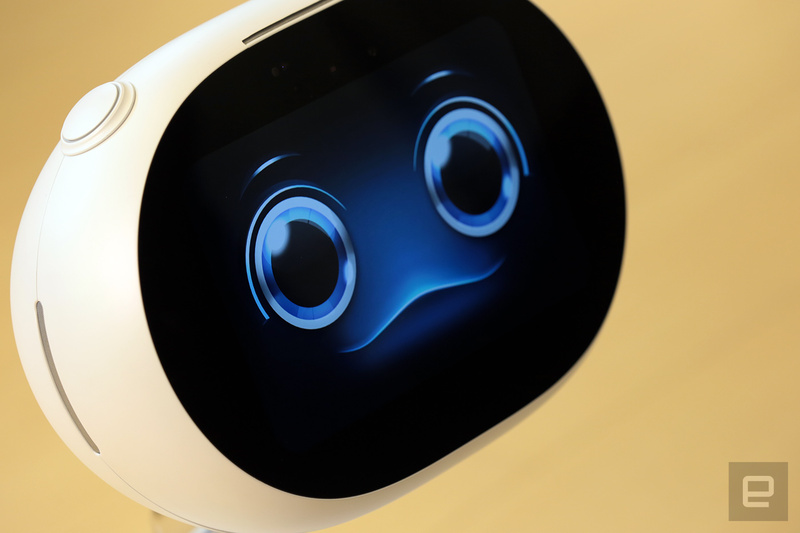 Unlike its spherical body, Zenbo's face comes in a "paper clip" oval shape to accommodate a 10-inch touchscreen that's occupied by a cute animated cartoon face most of the time. You'll also find a conventional camera and a depth camera -- likely similar to the one ASUS made for Softbank's Pepper -- right above the screen, which help with surveillance, face and object recognition, and taking photos. There's a socket at the top left for future accessories, which could include a projector, according to Shih. While there's no word on what processor is inside, it's pretty obvious that Zenbo runs on Android, which could help entice developers to create apps for Zenbo. As to how ASUS has managed to get the price so low, again, Shih wasn't willing to comment. Instead, he went on to explain the design thinking that strictly focused on the essential features. For one, limbs and fingers would be too costly to make, nor would they be practical given today's technology; they aren't precise enough to pick up pills for the elderly, for instance. In Zenbo's case, the wheels alone are sufficient for surveillance and basic remote assistance purposes. There's also a reason why Zenbo was made to look like a cartoon-like character, with the personality of a five-year-old: A realistic human-like robot would be a bit intimidating, not to mention costly. A kid-like design, meanwhile, would appeal to all ages, says Shih. This is especially important for children, who will treat Zenbo as a playmate and dance with it, watch it act out a story, or even try some kid-friendly programming to boost their logical thinking. 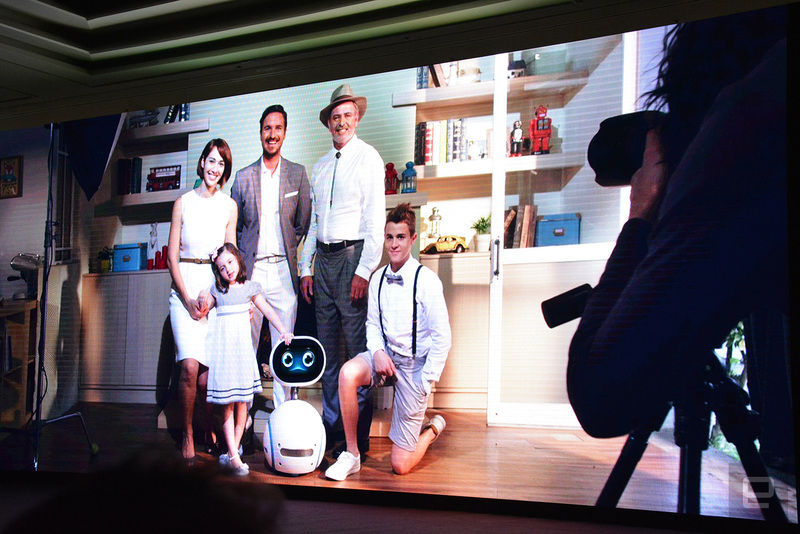 The seemingly intuitive voice commands -- initiated by saying "hey Zenbo" -- helps as well, and Shih said Zenbo's natural language processing will get better over time with machine learning. These make features like screen-sharing remote assistance and screen casting to TV a whole lot easier than digging them up in the menus, which can be challenging for elderly users. But more importantly, they will potentially benefit from Zenbo's fall detection emergency feature: If a fall is detected by their wearable devices (in this case, a ZenWatch 2), Zenbo will automatically call a designated contact to start a video chat, and offer remote control via an app. With just under half a year to go, it'll be interesting to see what new features Zenbo will get by the time it launches. Regardless, we have a feeling that this machine will sell well, and make for a fun home helper, but whether it'll arrive on time or come in at $599 as promised, that's a whole different story.